When my partner recently suggested that we use our time off to take a little vacation, I was excited. We hadn’t been out of town together in awhile. 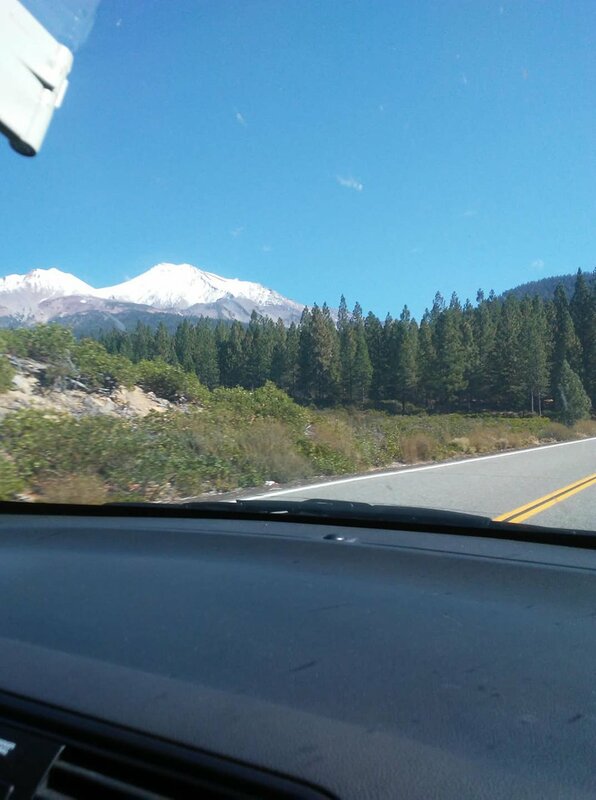 He had been wanting to visit Mount Shasta. I wanted to go there too but was also intrigued by Sedona, Arizona; I had never been to either spot. (Vortex vacay! Both places are alleged to be powerful energy vortexes.) Mount Shasta won, we ended up going there for a few days, and am I glad we did. It was a long drive up from Southern California to the Northern part of the state. The 5 freeway is lined with farms. I was disconcerted to see cloud seeding happening above the organic farms as we drove. There is at least one farm I noted that I would like to gift some tower busters to as soon as I get some more stock made. Since I have evidence that scalar energy can prevent the heavy metals from falling into our food, https://www.wuwuwoman.com/blog/2018/4/25/evidence-that-scalar-energy-repels-geoengineering-pollution I think it is probably a good idea to get this technology into the hands of as many farmers as possible. We checked into our hotel, a rustic inn, and rested up to spend the next couple of days exploring this magical mountain. I also loved the town itself. The locals were friendly and helpful, an eclectic mix of regular town folk to the most far-out hippies. Each restaurant we ate at was good with friendly service. I have to say, I was not expecting to shop on this trip, but crystal lovers, hold onto your wallets! The downtown area is dotted with amazing crystal and metaphysical shops. Each shop was unique and had some great finds. I definitely gave my wallet a workout, and got some neat crystals that are fairly uncommon. Back to the mountain. I could tell as we drove up the mountain, that this is a special place. I brought some tower busters to gift around the mountain area. (Gifting is the act of leaving an orgone device in an area to benefit the environment) Part of me hesitated about gifting there for a second; this is sacred land. Even though I am doing something positive to help the environment, should I leave it alone? Then I thought, of course I should gift there, as the tower busters emit positive energy which could be amplified by the powerful energies there. It wasn’t until after I actually returned from my trip that I learned that locals there had tested their mountain water, and it came out positive for containing high levels of aluminum! That immediately alleviated any small pang of guilt I had felt for leaving something on the mountain. I actually wish I had gifted more since the mountain covers such a large area. Even sacred mountains are not safe from the perils of cloud-seeding operations. Locals drink the mountain water constantly, it is something that I partook in and loved, drinking water straight from the Earth. One local man told me it takes the water 50 years to go from snow at the peak to water flowing out to drink. That water is going to be polluted unless we can either A) make weather modification illegal and protect our lands, or B) Use as many scalar energy devices as we can in order to stop these toxic metals from going into our water and bodies. I plan on returning in the spring to do more gifting. If there are any orgone artisans local to the Mount Shasta area, ( I wouldn’t be surprised, people there know about this technology. Everyone was commenting on my orgone pendant and knew what it was) I suggest gifting, let’s work together to see if we can get the metal levels down in the water. It would be great to grid the mountain and get a later test done to compare results. Another thing about this place, is that it is rumored to have entrances to the inner Earth, where advanced 5th dimensional beings live. I try to be flexible in my beliefs. I only believe things if there is either strong evidence for them, or if I have experienced or seen it for myself. I think it’s best to be completely open to possibility while remaining firmly grounded in reality. That being said, I had an interesting encounter with some Chinese tourists that made me think perhaps there is some truth to this rumor. 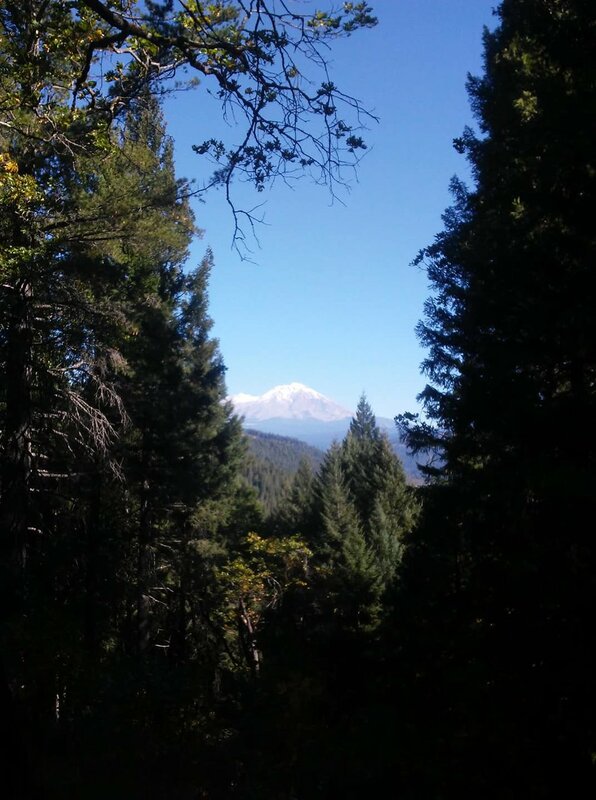 Many people have reported having encounters with these beings on Mount Shasta. As my partner and I were being led by a helpful local man to a spot to fill your water bottle from the mountain, three girls approached asking about the same water spot. I invited them to join us as we were going there as well, and we all walked down the hill to the creek. These girls seemed perfectly nice and normal, I would not peg them as “fruity” in any way. But I could sense their energy. Being empathic, I could tell that they were heavy meditaters, their vibration felt extremely high. They explained to me that in raising their vibration through meditation, they were able to see and communicate with the inner Earth beings there, and received many profound messaged from them. I asked if they see them psychically or with their eyes. The girl answered that they can see them with their eyes, that they look just like us except that they are light beings. 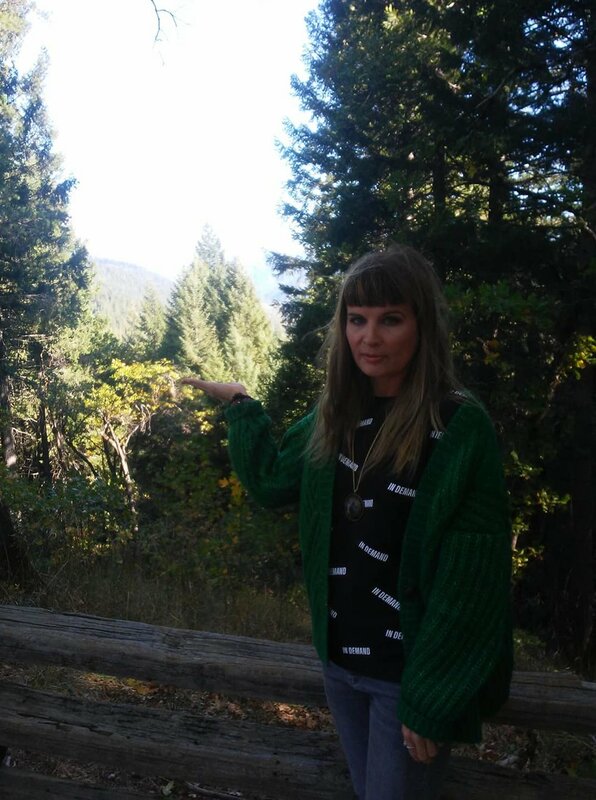 They said that the mountain is the entrance to the 5th dimension and a city called Telos. I did not think that these girls were pulling my leg at all, and I did not think that they would come all the way from China to spend 18 days on the mountain just to hike around. I think I am going to step up my meditation practice. I was meaning to do so anyway, how intriguing. I felt very connected to this powerful place and did not want to leave. But alas, my partner and I had to get home and get back to our kitties. On our way out of town we made one final stop, and it had a profound effect on me personally. 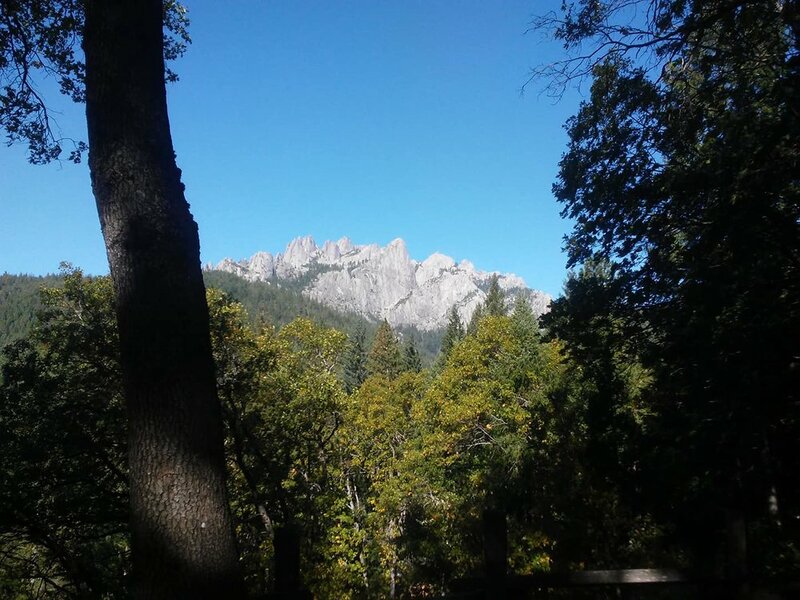 Castle Crags has large spires called dolmites that rise to an elevation of 6500’. Geologists found that these rock formations are 225 million years old, much older than that of Mount Shasta. Both Castle Crags and Mount Shasta are thought to be remnants of the ancient civilization of Lemuria. http://www.crystalinks.com/lemuria.html Just off the 5 freeway on the way out of town, we said what the heck and decided to stop to check out the spires. I did not expect to have the emotional reaction that I did. As soon as we stepped out of the car I was blown away by the energy at this place. It hit me much harder actually than even the powerful energy of Mount Shasta. The only thing I can liken it to is the highest vibration of pure love. 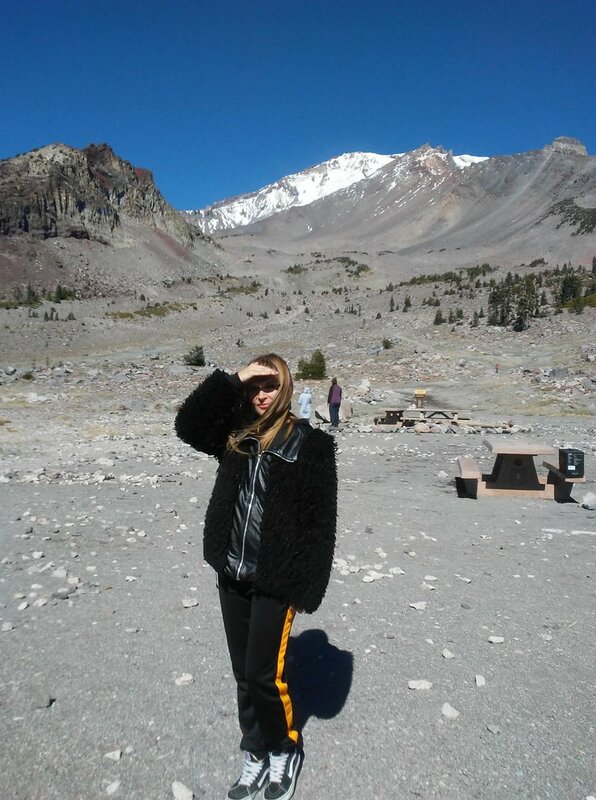 If you would like to read more lore about Mount Shasta, here is a link with some interesting stories. http://mtshastaspirit.org/general/some-interesting-history/ I will definitely be spending a lot more time at these special spots in the nearoff future. Let’s keep our head in the clouds, our feet in the Earth, and keep working for clean air and water wherever we find ourselves.